As with their other albums, A Pirate’s Christmas Wish is a bit goofy, and a lot unpolished. Mostly these qualities are put to good effect, although “I Saw Fannie Punching Santa Claus” is a little over the top in the silliness department, and “Blue Christmas” seems like something created on a drunken dare. “Deck the Halls”, however, is a wonderful mix of steel drums and scratchy pirate singing that truly conjures a group of caroling buccaneers. “Jolly Old Saint Nicholas” is another high point with tighter singing, and a fun mix of drums and jingle bells. “A Pirate’s Christmas Wish”, being the album’s title track and the only wholly original track (all others being parodies) is for me the best of the bunch, with fun “yo ho’s”, a great beat, and humorous, holiday appropriate lyrics. Every year I see more and more pirate insertion into the holiday season – pirate stockings, pirate ornaments, pirate nutcrackers, and so on. But pirate Christmas songs are still few and far between. 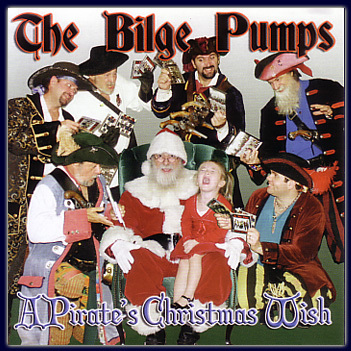 The Bilge Pumps have done a real service with this album, not only giving us an easy gift idea for any crew Secret Santa programs, but also providing us some fine tunes for any holiday pirate gatherings. 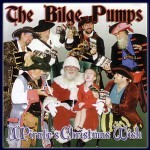 This entry was posted in Music and tagged bilge pumps, humor, pirate christmas by Bilgemunky. Bookmark the permalink.